Ayanna Pressley and Michael Capuano avoided direct personal attacks during Tuesday’s debate. The primary will be held on Sept. 4. 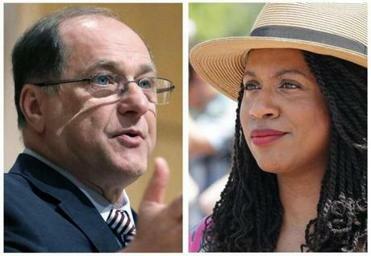 Editor’s note: Representative Michael Capuano has conceded to Ayanna Pressley in the Sept. 4 Democratic primary. Click here for more. 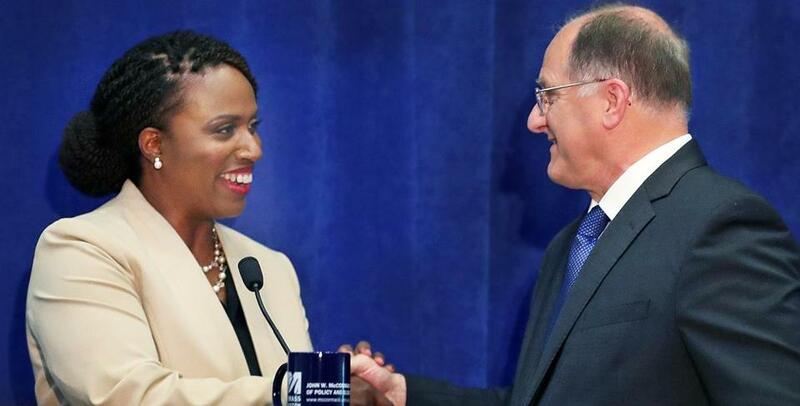 Representative Michael Capuano and City Councilor Ayanna Pressley ventured into touchy issues of race and seniority during a tense debate Tuesday between Democratic primary rivals who concede they agree on most policy matters. The hourlong debate, held before a live audience at the University of Massachusetts Boston, was civil but at times contentious as the candidates sought to convince voters that they can be more effective in stopping President Trump’s agenda and serving the needs of the diverse Seventh Congressional District. The contest has been nationally watched as a test of the strength of the antiestablishment sentiment in the grass roots of the Democratic Party. Pressley, the first African-American woman elected to the City Council, is hoping to capture that insurgent mood, and repeatedly emphasized during the debate that she would seek to rally local activists to oppose Trump. She also acknowledged that race should be a factor voters consider in the district, which is the only one in Massachusetts where a majority of residents are nonwhite. “You cannot have a government for and by the people if it is not represented by all of the people,” she said. Democratic incumbent Michael Capuano and his primary challenger Ayanna Pressely, a Boston City Coucilor, are debating at UMass Boston. Capuano responded by saying that he agrees “that race does matter, as does gender, as does gender identity,” before quickly turning the discussion back to his record of delivering federal funding to renovate community health centers, improve the Fairmount Commuter Rail Line though Dorchester, Mattapan, and Hyde Park, and rebuild the Whittier Street public housing development in Roxbury. The debate, sponsored by The Boston Globe, WBUR, and UMass Boston’s McCormack Graduate School of Policy and Global Studies, came at a critical juncture in the campaign. With the primary election looming Sept. 4, Capuano is leading in polls and recently launched his first television ad highlighting his progressive record and staunch opposition to Trump. Both candidates avoided direct personal attacks during the debate, and there did not appear to be one single, explosive clash to upend the largely respectful tenor of the contest. But there were several revealing exchanges, as the candidates, pressed by the moderators, WBUR’s Meghna Chakrabarti and the Globe’s Adrian Walker, explored how the differences in their personal backgrounds might inform their approaches to the job. “We will vote the same way, but we will lead differently,” said Pressley, who has talked about surviving sexual assault and being raised by her mother because her father was addicted to drugs and incarcerated. “I will lead in coalition and in partnership with community to spotlight and emphasize new things,” such as racial disparities in maternal health and a bill of rights for survivors of gun violence. Capuano, a former Somerville mayor first elected to Congress in 1998, said his experience in Washington matters, arguing that Senator Edward M. Kennedy, during his 47-year career, became more effective as his seniority grew. Pressley downplayed the importance of seniority, pointing out that Representatives Katherine Clark, Seth Moulton, and Joseph P. Kennedy III have built national profiles, despite being relatively new members of Congress. Capuano pushed back by noting that his voting record has received perfect ratings from groups such as the ACLU, Planned Parenthood, and the NAACP, and that he has been endorsed by Representative John Lewis, a civil rights icon. He also said he was only able to deliver funding for projects like the Fairmount Line and the Ruggles MBTA station because he knows how Congress works. Even as she acknowledged the importance of race in the election, Pressley strongly rejected the notion that she is running solely because she is a black woman. A lighter moment came when Pressley defended her support for defunding Immigration and Customs Enforcement. She said the idea was not outlandish, given that a federal judge recently admonished the Trump administration for giving psychiatric medication to migrant children without their parents’ consent. “The president has to be ordered not to give children psychotropic drugs, but I’m the one that’s tripping?” she said, sparking laughter from the audience of several hundred, including many supporters of both candidates. Michael Levenson can be reached at mlevenson @globe.com.